A new Counter Charge support and G Guardian for Dominate focused Nubatama Decks appears. Dominate – AUTO: [Counter Blast 1 & Soul Blast 1] When this Unit is placed on (GC), you can pay the cost. If you pay it, choose 1 of your opponent’s back row Grade 1 Rear-guards, Dominate it, and move it to your (GC). For Today’s Card, we’re introducing the following from the 11th Booster Pack “Demonic Advent”: The 《Nubatama》 G Guardian “Rikudo Stealth Dragon, Gehourakan” and the 【Dominate】 support, “Stealth Dragon, Tengai”. 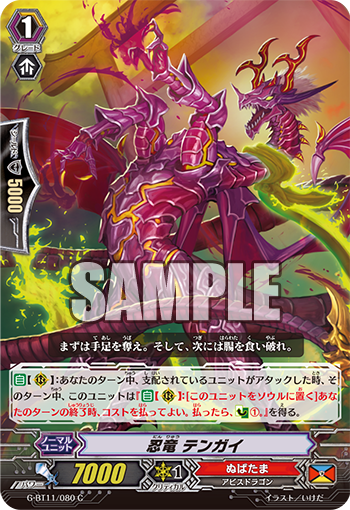 “Rikudo Stealth Dragon, Gehourakan” is a G Guardian who can make an opponent’s Unit Guard while Dominated. When it’s placed on the Guardian Circle, you can choose 1 of your opponent’s Grade 1 back row Rear-guards, Dominate it, and move it to your Guardian Circle, which is quite the amazing skill! From this, you’ll gain a maximum shield of 20000. After Guarding, the opponent’s Unit is moved to the Drop Zone, so you’ll be able to put your opponent’s plans in a loop if you Dominate and then Retire your opponent’s troublesome “Witch Doctor of the Powdered Bone, Negrobone” and “Steam Sniper, Lishma”. And “Stealth Dragon, Tengai”, at the end of a turn in which your opponent’s Dominated Unit, you can place Tengai into the Soul to Counter Charge 1. With one “Tengai”, you can recover the cost of the previously introduced “Gehourakan”! The Dominated Unit’s attack doesn’t even need to hit to ensure the condition being satisfied. You can aim to activate it using things like the Stride Skill of “Demonic Stealth Dragon, Shiranui “Oboro””. From here onward, we’ll be introducing cards from the 11th Booster Pack “Demonic Advent”! So enjoy!